It's the Saturday before Oscars. And that can mean only one thing! Yes, this year's Razzie Award winners have been announced. The crop of cinematic crap in 2016 was so extensive that this year's 37th Annual Razzie Awards expanded from 5 nominees to an unprecedented 6 contenders in each of its 9 Worst Achievement in Film categories. Leading this year's list of movie-misfires were the 15-years-too-late sequel Zoolander No. 2 and the WTF comic book battle-royale Batman v Superman: Dawn of Justice. Each was up for both Worst Picture and Worst Prequel, Remake, Rip-Off or Sequel. Other Worst Picture nominees include Dirty Grandpa, Gods of Egypt, Hillary's America and Independence Day: Resurgence. Many expected Batman v Superman would take Worst Picture of the year. But it failed to live up to even that hype, proving it can't catch a break. Instead, the Worst Picture Award went to a truly despicable piece of tabloid cinema known as Hillary's America. And it was able to sweep a few other categories as well. Acting contenders included Ben Affleck, Johnny Depp, Julia Roberts and Robert de Niro. But thanks to the complete list of winners at Razzies.com, we see that documentarian Dinesh D'Souza won Worst actor portraying himself in Hillary's America. And Becky Turner, who played the lead role in The Secret History of the Democratic Party, took worst actress portraying Hillary Clinton. This is perhaps a good thing. Had Ben Affleck won worst actor for Batman V Superman, it could have been the straw that broke his proverbial back, and we might have actually seen him walk away from The Batman for good. The "Winners" of this year's tackiest Tinsel Town trophy were revealed this morning, Saturday, February 25, the now traditional day before the 89th Annual Giving Out of the Little Gold Naked Men. It hadn't been revealed who was nominated for the Razzie's newest award, the Razzie Redeemer Award at the time nominees were announced. But we now know it was 2014 Worst Supporting Actor nominee Mel Gibson, who redeemed himself with his Oscar-nominated direction of Hacksaw Ridge. First introduced in 2014, the Razzie Redeemer Award goes to the former Razzie winner who has gone on to redeem his or her self through good movies. Ben Affleck won the first award in 2014, for his recent work in Argo and Gone Girl, although he was nominated again this year for Batman v. Superman: Dawn of Justice. Sylvester Stallone won the award last year, after his comeback performance in Creed which won him a Golden Globe award and an Oscar nomination. Other "top" winners this year included Kristen Wiig, who wasn't nominated for Ghostbusters, but instead roped in her first Razzie for Worst Supporting Actress in Zoolander No. 2. Jesse Eisenberg won the Worst Supporting Actor trophy for his turn as Lex Luthor in Dawn of Justice. Ben Affleck and Henry Cavill did manage to lockdown an award for Worst Screen Duo, as Batman and Superman in Dawn of Justice. And the movie earned the Worst Prequel, Remake, Rip-Off or Sequel award. It also took home the Worst Screenplay trophy. Voting Razzie Members (1,014 from 49 US States and 24 countries) selected contenders in 8 of our 9 categories. 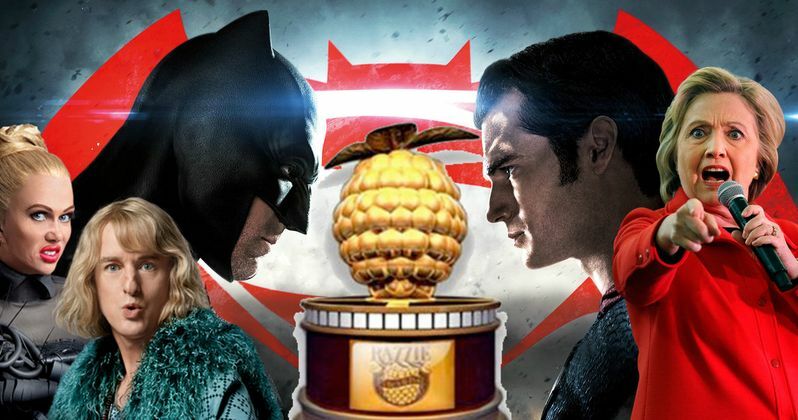 For Worst Screen Combo, The Razzies partnered again with Rotten Tomatoes where tens of thousands of users picked the nominees. Take a look at the full list of Razzie nominations below, with all of the winners revealed with a star.